Summer afternoon in Stein am Rhein (Stone on the Rhine) a little town in the canton of Schaffhausen in Switzerland. The sun is shining high in the sky urging tourists to look for a shade under a tree, in a café or a bar in the old part of town. Their eyes wandering around the frescoes and mosaics on the tall medieval buildings, making it easy to tell who’s a local and who’s just visiting this unusual place. Tourists are clearly impressed by the play of colours on the facades, each one more beautiful than the last. The summer sun is actually doing visitors a favour, chasing them away into the narrow streets where they can find a nice restaurant or a shop selling handmade goods. 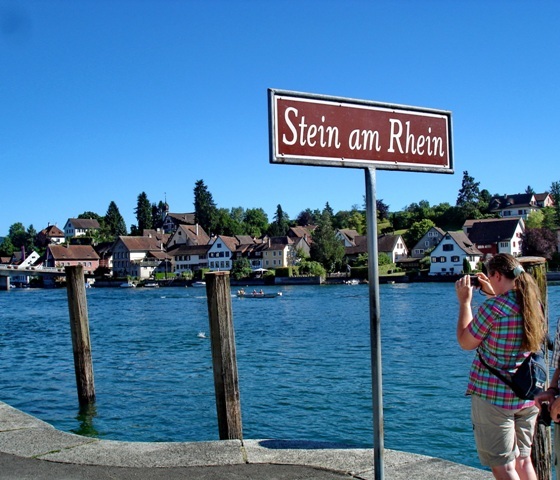 Stein am Rhein is a town you fall in love at first sight, justifiably called the “colourful town”. In the meantime, local residents have a whole different idea of how to deal with the heat. They can be seen running around wearing swimming costumes, trying to get to the bridge at the entrance of town as fast as possible. We follow them. A dozen of children are getting ready to jump from a few metres height. They are lined up on one side of the bridge waiting for a sign from their friend who is standing on the other side, checking if there are any boats passing underneath. Suddenly, he gives an all-clear sign and they start jumping one by one, each trying to find a more attractive way to dive into the crystal clear waters of the Rhine. The river current takes swimmers back to the banks and in a few minutes they are up on the bridge doing amateur diving to the amazement of a group of curious tourists. 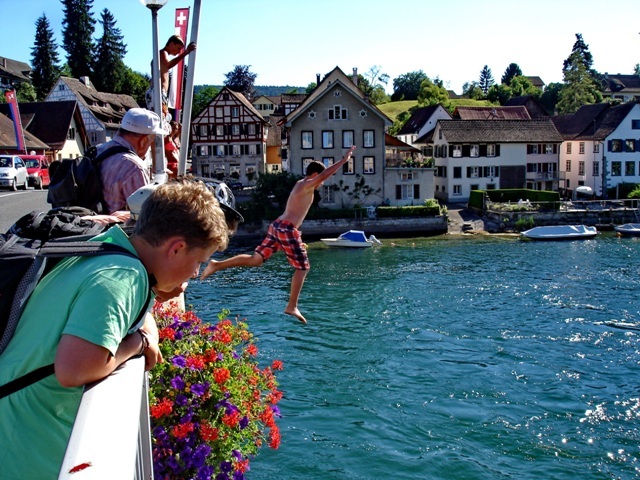 Enjoy Balkon 3 photo gallery of the colourful Stein am Rhein and the divers into the Rhine.